News — Lance H. Brown M.D. If new wrinkles and sun spots seem to appear overnight, chalk it up to cumulative sun exposure and waning estrogen levels, which affect skin's firmness, elasticity, and moisture, says Lance Brown, a clinical assistant professor of dermatology at New York University School of Medicine. Although you can't undo the past, you can combat further damage and reduce your risk of skin cancer. Apply a moisturizer and a broad-spectrum sunscreen with SPF 30 or higher under your makeup daily, even on cloudy days, says Brown. Choose a sunscreen thatcontains zinc or titanium and avoid any with oxybenzone, which can cause allergic skin reactions and potentially disrupt hormones. We are very pleased to announce that Dr. Adele D. Haimovic will join our practice in September 2017. Adele D. Haimovic, MD is a board-certified dermatologist and fellowship-trained dermatologic surgeon who specializes in surgical, cosmetic, and medical dermatology. After graduating from the University of Pennsylvania, Dr. Haimovic earned her medical degree at New York University School of Medicine. She went on to complete her internship and dermatology residency at New York University Langone Medical Center where she served as chief resident. Dr. Haimovic received advanced fellowship training at SkinCare Physicians in Massachusetts where she trained under internationally recognized leaders in dermatology. At SkinCare Physicians she completed a fellowship in Mohs Micrographic Surgery for skin cancer as well as an American Society for Dermatologic Surgery fellowship in cosmetic dermatology. She has co-authored numerous book chapters and scientific papers in peer reviewed journals on cosmetic procedures, dermatologic surgery, and general dermatology. "The real benefits may come from avoiding super-hot showers in the first place. Hot water might feel good, but it does a number on your skin and hair, explains New York City-based dermatologist Lance Brown, MD. "Hot water will strip away some of the natural, protective oils that your skin makes," he says, which can leave skin feeling dry and itchy and possibly exacerbate skin conditions like eczema. This is especially problematic during the winter months, when cold air outside and dry heat inside naturally make skin more parched." "Dr. Brown recommends short, 10-minute showers in lukewarm or mildly cold water. Lather up with a gentle, fragrance-free soap, pat your body dry with a towel, and follow up with a moisturizer on still-damp skin. Enjoy the glow!" Dr. Lance H. Brown Is one of New York's Best Doctors for 2016. We are happy to share that New York Magazine has recognized Dr. Lance H. Brown as one of New York's Best Doctors for 2016. 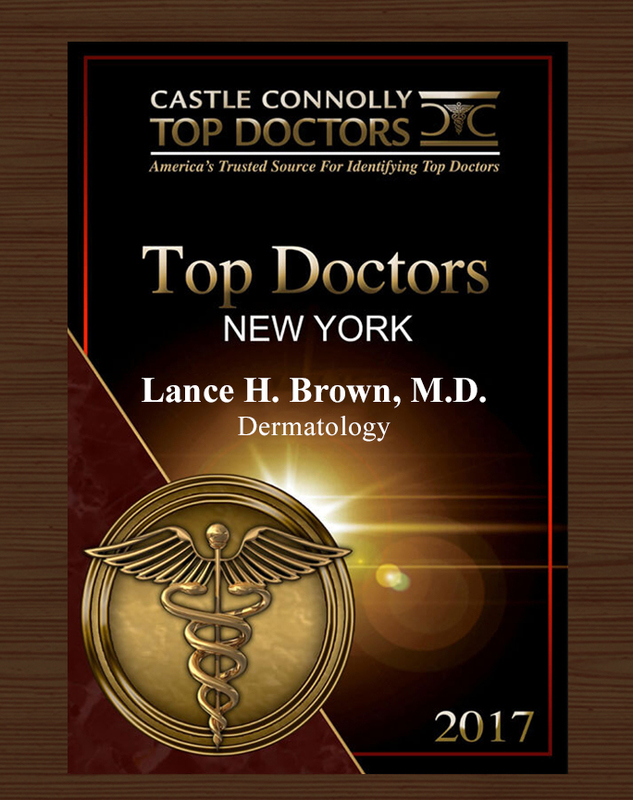 Dr. Lance H. Brown is honored to have received this recignition from Castle Connolly Top Doctors.